On 22nd June 2010 at 6.07 PM the London brigade of the Greenwash Guerrillas got a call from a panicked pedestrian outside the National Portrait Gallery. It seemed that the prizegiving ceremony for BP Portrait Award was about to start, and toxic greenwash had begun to gush uncontrollably from the gallery’s front doors. Arriving on the scene, armed with the latest in greenwash detecting equipment and wearing protective biohazard suits, the Guerrillas immediately identified several sources of the leak. Greenwash levels appeared to be the strongest anywhere a bright green BP logo was to be found: from the massive banners fronting either side of the grand entrance, to the microscopic embroidery on a security guard’s lapel. The Guerrillas were given the run-around by gallery security and the Metropolitan police, who escorted Britain’s cultural establishment into the awards ceremony first at the front, then around the side, then back at the front entrance again. By 7 PM, everyone had convened at the front entrance, and the Guerrillas set to work to contain the leak, quarantine the area, and warn attendees against entering the building. Many clean-up efforts were tried, from throwing golf balls and old tires at the leak to trying to plug it with mud, but for some reason the spill just kept gushing. Meanwhile, some Guerrillas attempted to arm the attendees – most of whom, inexplicably, were determined to enter the contaminated building – with information about BP, oil industry sponsorship of the arts, and the best way to protect themselves from greenwash. Despite the best efforts of the Guerrillas, greenwash unfortunately continues to spew forth from the BP-sponsored National Portrait Gallery and countless other oil-sponsored arts institutions across London. But resistance is growing, and this summer might just be remembered as the tipping point in the campaign to free art from oil. BP’s sponsorship of the National Portrait Award is greenwash – a way of cleaning up BP’s tattered public image and covering up its shocking environmental and human rights record. Greenwash is as toxic as oil. With it, BP buys our approval, and hopes we’ll forget about the gusher in the Gulf, the 300 000 lives already lost each year due to climate change, and the fact that the company is poised to enter the Canadian tar sands – the most destructive project on earth. 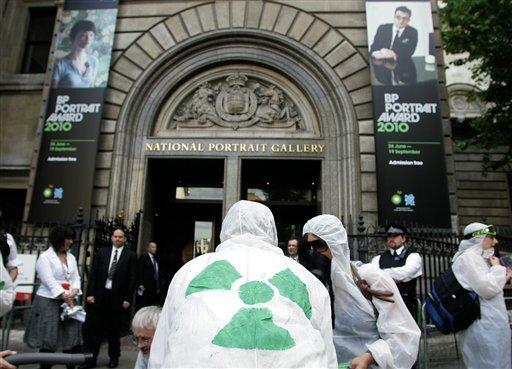 Every pound the National Portrait Gallery accepts from BP is tainted. In response to changing public opinion, cultural institutions eventually decided that it was no longer in their best interests to take money from the tobacco industry. It’s high time we kicked Big Oil out of our galleries too. 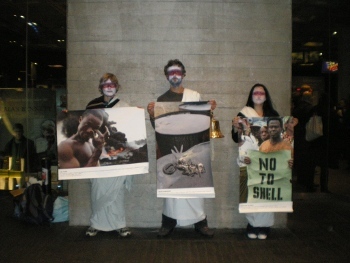 On Wednesday 15th October Art Not Oil made it’s first visit to the National Theatre to highlight Shell’s sponsorship of the autumn production of Oedipus. Shell is sponsoring the National Theatre’s new production of ‘Oedipus’, and, unsurprisingly, Art Not Oil is preparing a response on various fronts. We’re asking people if they’re up for making an artwork of some kind as a response This could be an image, song, film or poem to appear on our website, or to be printed on a postcard or something similar. We’re open to ideas. (Unfortunately, we aren’t able to pay for your work, but we have no wish to possess it!) If this is of interest, we’d love to see it as soon as possible, as ‘Oedipus’ runs until January 2009 only. New York Times columnist, war-monger, and Greenwasher extraordinaire Thomas Friedman gets pied while speaking at Brown University last week. Read on for the press release! The prank was part of “Fossil Fools Day”, an international day of protest focused on the energy industry and climate change.